On a Low Carb diet? Try replacing flour with ground almonds! 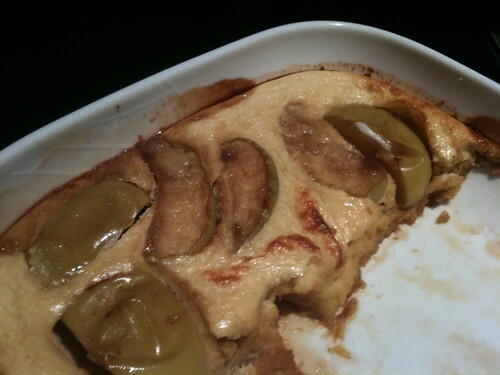 Recipe for puff apple pancake from Tummyrumble. Note: this photo was published in a Jul 24, 2009 blog titled "Aussie goes NYC." It was also published in an Apr 17, 2010 blog titled " Smyrna Fresh Produce Market," and an Apr 22, 2010 blog titled "Fresh and Locally Grown: A Great Farmers Market is Just Minutes Away." And it was published in a Jun 6, 2010 blog titled "Juliet Schor on Plenitude." It was also published, in a tightly cropped format, in a Jun 9, 2010 blog titled "Show Me the Slow Money." And it was published in a Jun 13, 2010 Swedish blog titled "Mp = matprotektionisterna," as well as a Jun 13, 2010 San Francisco blog titled "73. Farmers’ Market at Fort Mason." It was also published in a Jul 16, 2010 blog titled "Support the Lake Mary Farmer’s Market." It was also published in an Aug 30, 2010 OurWorld 2.0 blog titled "How Things Work: Food Energy." And it was published in a Sep 8, 2010 blog titled "Vegetarian check-in." 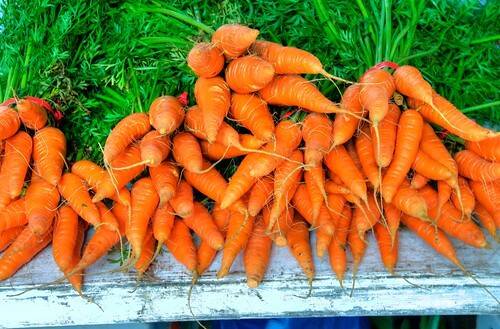 It was also published in an Oct 9, 2010 "Zen to Fitness" blog, titled "Boost Digestion With Carrot Salad…." And it was published in an Oct 31, 2010 blog titled До НГ 61 день, позитивное (at http-slash-slash-place-30p3.livejournal-dot-com-slash-414074-dot-html), which means … well, actually, I have no idea what it means. But it’s all good… It was also published in a Nov 22, 2010 blog titled "The Music Industry shows us how to add marketing value!" Moving into 2012, the photo was published in a Jan 3, 2012 Mrs. Pantry’s Blog posting titled "Carrot Soup with a Kick and Quick Croutons." It was also published in a Feb 6, 2012 blog titled "The #1 Tool To Improve Your Health: Your Fork!" And it was published in an undated (late Apr 2012) Squidoo blog titled "Basics of Juicing and Recipes." It was also published in an undated (late Apr 2012) blog titled "Smyrna Fresh Produce Market Starts May 5th." And it was published in an undated (late May 2012) blog titled "The 8 Best Foods to Buy at Farmers’ Markets." It was also published in a May 30, 2012 blog titled "Diversification j’écris ton nom." And it was published in an Aug 1, 2012 blog titled "WOULD YOU DATE A VEGETARIAN? 30 PERCENT OF OMNIVORES WOULDN’T."